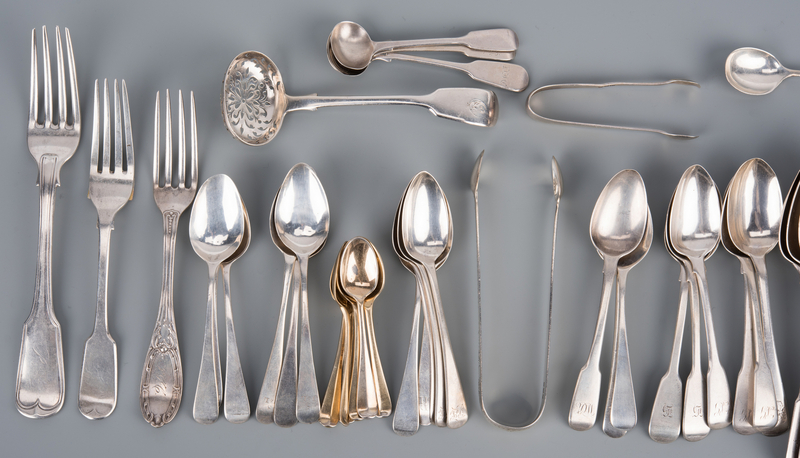 Group of assorted sterling silver with English hallmarks including George III, George IV, Victorian, and 4 early 20th century examples, 46 pcs total. George III: Thomas Bowen II (4 place spoons), Thomas Dicks (4 teaspoons), Richard Crossley and George Smith IV (3 teaspoon), Thomas Barker (2 teaspoons), William Eley and William Fearn (1 teaspoon), John Blake (1 teaspoon), Richard Crossley (1 teaspoon), Richard Evans (1 teaspoon), George Mauger (1 fork), and George Wintle (sugar tongs). 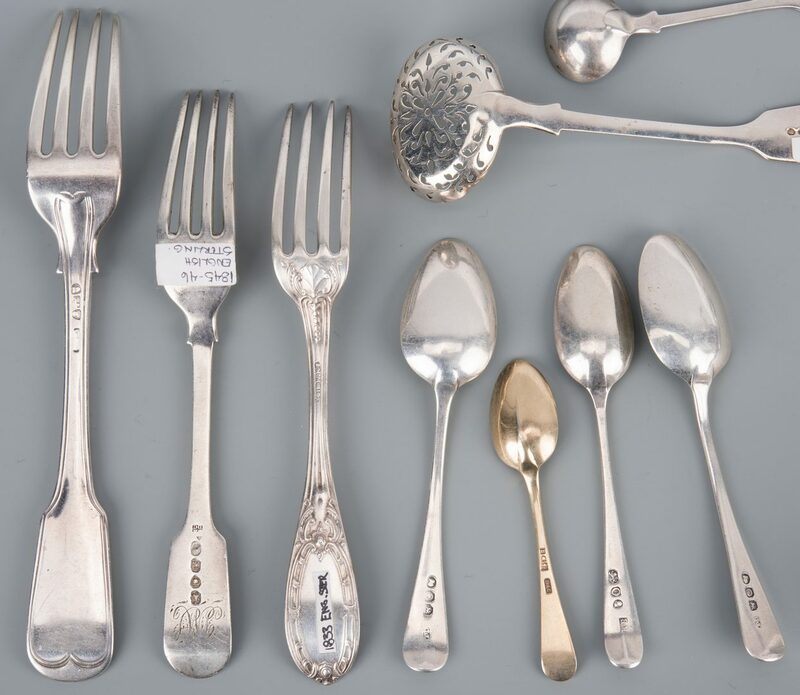 George IV: William Bateman I (2 teaspoons), William Chinnery (1 teaspoon), James Beebe (1 teaspoon), William Chawner II (1 teaspoon), and 1 salad fork marked sterling. 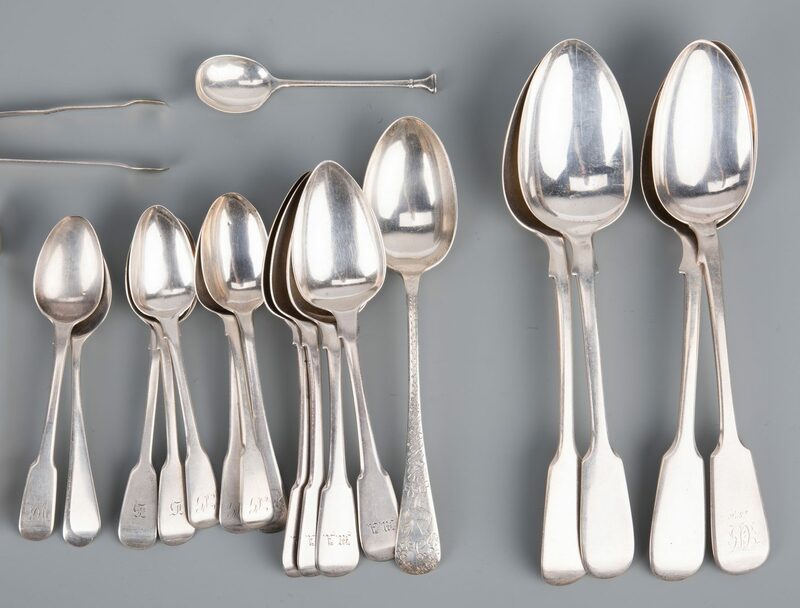 Victoria: Lionel Alfred Crichton (7 5 o'clock teaspoons), William Rawlings Sobey (4 tablespoons), Samuel Hayne and Dudley Cater (1 teaspoon, 1 fork), Thomas Wallis (1 salt spoon), John Smyth (1 salt spoon), Charles Boyton (1 salt spoon) and Robert Wallis (1 bon bon spoon). 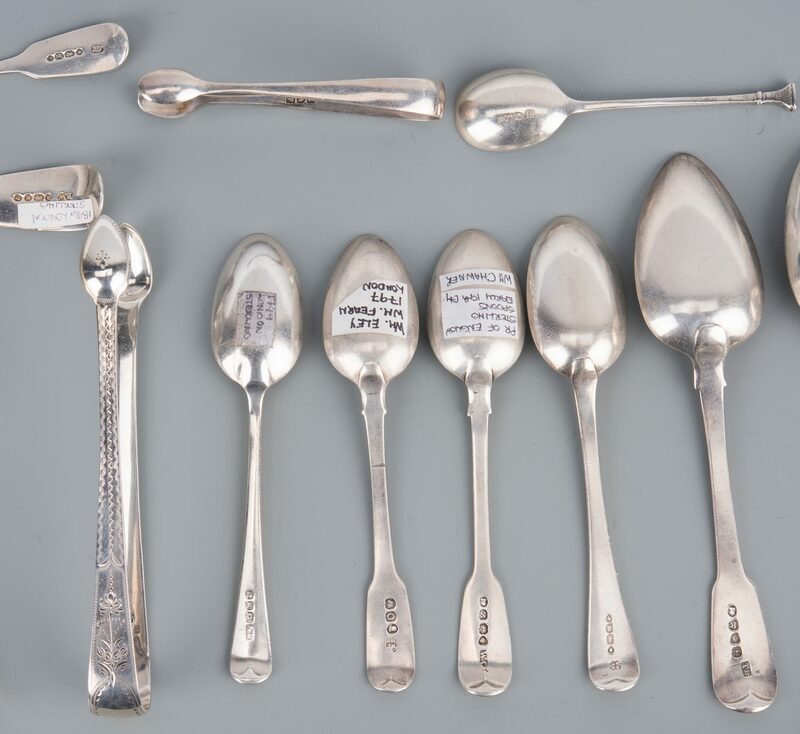 Early 20th Century: Albert Beardshaw & Co. (1 place spoon), Joseph Walton and Co. (1 teaspoon), Cooper Brothers and Sons (1 seal top spoon), and William Hutton and Sons Ltd. (sugar tongs). 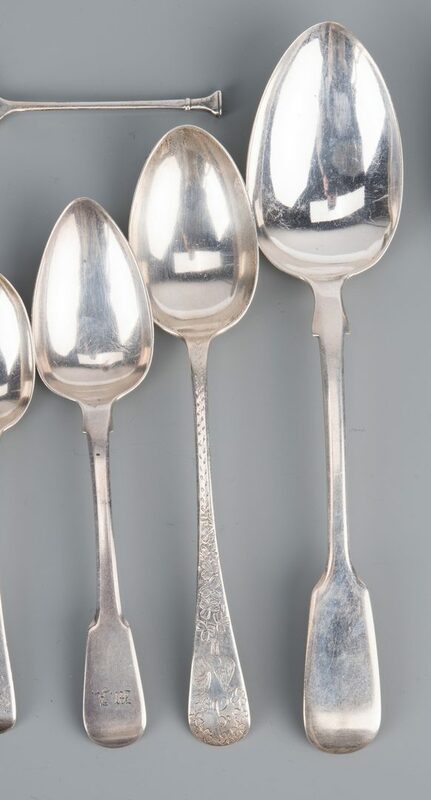 3 5/8" to 9" L. 39.76 total troy ounces. 46 items total. Provenance: Private Knoxville, TN collection. 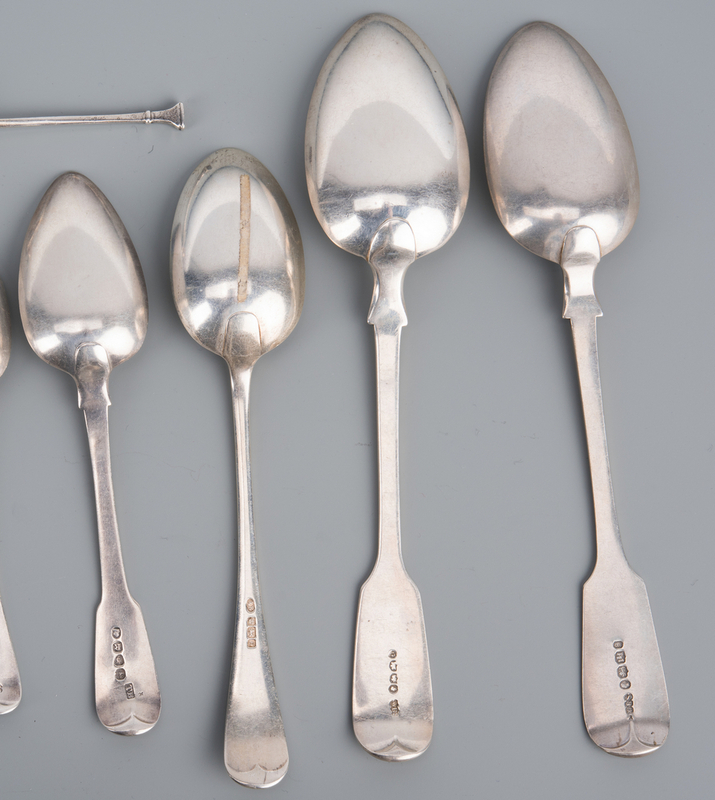 CONDITION: Most pieces show wear consistent with use. Most monogrammed.